In Part 1 of Designer Veneers At Superior Woodcraft we introduced you to some wonderful new composite wood surfaces (wood veneers). These wood veneers were developed by Ettore Sottsass. 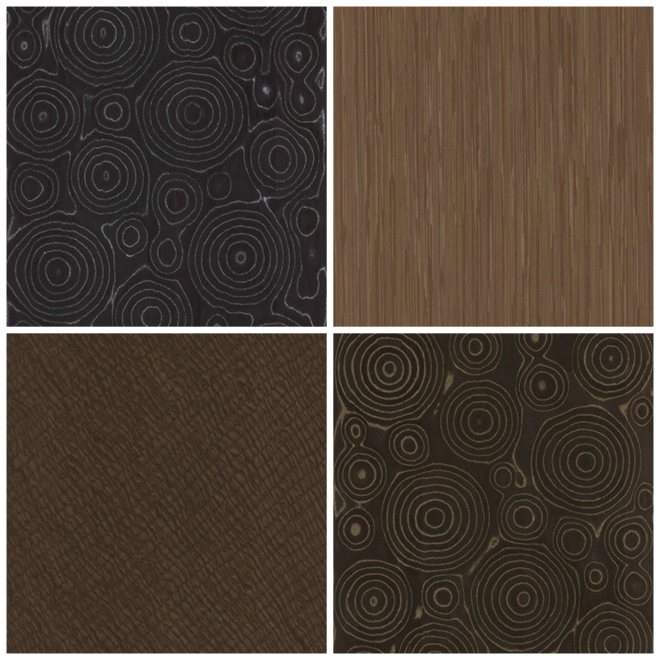 In Part II of Designer Veneers At Superior Woodcraft we introduced you to veneer designs by Front Design. Today, our third introduction encompasses the work of the Campana Brothers, Fernando (born 1961) and Humberto (born 1953). The Campana Brothers are Brazilian designers whose work incorporates the idea of transformation and reinvention. Their work gives value to poor, mundane and common materials by incorporating them into furniture, installations, interiors and products. Such materials include scrap and waste products such as cardboard, rope, cloth and wood scraps, plastic tubes and aluminium wire. The use of these common materials not only highlights their creativity, but it also demonstrates Brazilian characteristics – colors, mixtures, chaos and the triumph of simple solutions. They made their name with the development of the Favela Chair in 1991 which was made from scraps of wood. They went on to design the Vermelha Chair, the Cone Chair and Estela Lamp. The Campana Brothers were first noticed in 1998 by the media, when they became the first Brazilian artists to exhibit their work at The Museum of Modern Art in New York. Their breakout design of the Vermelha chair is still their best seller. The Campana Brothers began working together in 1983 in Sao Paulo, Brazil, where they still live and work. Humberto trained to be a lawyer but gave it up to be a sculptor and Fernando studied architecture but decided to work with his brother to experiment with design and making furniture. Their work originates from Estudio Campana, which is based in Sao Paulo, Brazil. A Retrospective of their work was shown at the Design Museum, London and their pieces are regularly shown in museums around the world. The Campana Brothers works are represented by Carpenters Workshop Gallery, Firma Casa, Friedman Benda and Giustini/Stagetti. We hope that you enjoyed your introduction to the Campana Brothers veneers available at Superior Woodcraft. Be sure to stay tuned for more interesting designer veneers that will inspire you. Please contact Superior Woodcraft to commission our artisans to create a truly unique custom project that is perfect for you.